The Brusnwick Corporation, one of the world's biggest builders of production boats, has announced that it is planning to sell off their Hatteras and CABO yacht brands. In a statement about the decision to sell, Brunswick Chairman and Chief Executive Officer Dustan E McCoy said: “This action reflects our decision to exit the sportfishing convertible category and to concentrate our resources in the yacht segment on our remaining brands, Sea Ray and Meridian Yachts. When completed, this action will also contribute to our goal of a break-even or better Boat Segment in 2013, even if the larger sterndrive/inboard fibreglass markets do not improve. In October, Hatteras exhibited a redesign of its popular 80 motor yacht during the Fort Lauderdale International Boat Show. Brent Barkley, director of marketing and product portfolio for Hatteras and CABO Yachts, said at that time that Hatteras had sold 45 Hatteras 80s since the model debuted in 2003. 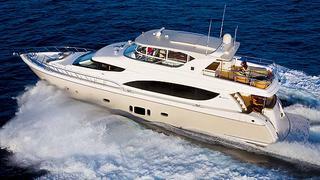 Hatteras Yachts is considered a world leader in the construction of convertible sport fishing and luxury motor yachts. It began production of its first model in 1959 and pioneered the production of large fibreglass sea boats. Brunswick purchased Hatteras Yachts in 2001 and CABO in 2006.